When I'm in a squeeze without a lot of time to cook dinner, but still want to make something that looks and tastes upscale, I often turn to pork tenderloin. --- Boneless pork tenderloins average about a pound apiece and cook very quickly. 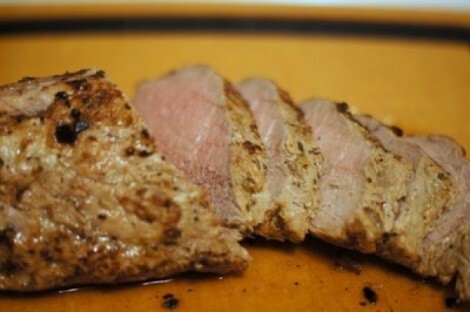 With this recipe, you'll wind up with a tenderloin that is juicy and has great flavor, but that takes less than 20 minutes to cook. The key is allowing the pork to marinate for at least a few hours before cooking. The marinade recipe here makes enough for a couple of one-pound pork tenderloins. 1/3 cup olive oil, plus 2 Tbs. for sauteing. First, zest one of the lemons. Save the lemon for juicing. In a small bowl, whisk together the lemon zest, lemon juice, 1/3 cup olive oil, garlic, rosemary, thyme, 1 tsp. salt, and Dijon mustard to make a marinade. Pour the marinade into a resealable plastic bag and add the pork tenderloins, turning the pork pieces to coat them. Seal the bag and refrigerate. Allow the pork to marinate in the refrigerator a minimum of 3 hours, but overnight is better. When you're ready to cook, preheat the oven to 400 degrees F.
Remove the pork from the plastic bag and sprinkle it generously with salt and pepper. Heat 2 Tbs. olive oil in an ovenproof skillet over medium-high heat. Saute the tenderloin(s) on all sides until nicely browned. Place the pan with the pork into the oven and roast for 10 to 15 minutes, until the meat registers 138 degrees F. in the thickest part of the pork. Remove the tenderloin(s) and wrap in tinfoil. Allow the pork to rest for 10 minutes. Cut the pork into 1/2-inch thick medallions and serve with any leftover pan juices. I find that a bottle of Coppola Winery Sofia Rose pairs very nicely with the pork.